Photo courtesy of Francisco X. Guerra. Amy Fae is a Cabaret Fusion dancer who has been shaking and shimmying for over 15 years. Besides being half of the tasty treat Baba Ghanoush, she is a member of Troupe Aubergine under the direction of Nina Amaya, as well as an instructor and soloist. Amy Fae enjoys performing whether it’s in a group, a duet, or as a soloist. She loves the joy and humor she shares while dancing with Alizarin. You can find her soloing to traditional or indy-rock song selections at local haflas, whimsically dancing her way through the Pennsylvania and Maryland Faerie Festivals (often with fellow Aubergines), and dancing for private and charity events in the Baltimore and Westminster areas. Amy Fae has studied a variety of Middle Eastern and American belly dance styles, most notably with Nina Amaya, Mariza, Shems, and Atef Hassan in the Maryland area; Yuumi of Kanazawa, Japan; Serpentessa and Angelique of the Hudson Valley, NY area; and Allegra of Three Sisters Belly Dance, with whom she studied at Bard College in New York. Amy Fae can bring her joyful dance to you! She currently teaches an open-level Cabaret belly dance class at EMC Performing Arts Studio in Glen Rock, PA, on Tuesdays from 7pm-8pm, and offers private lessons in her home studio. 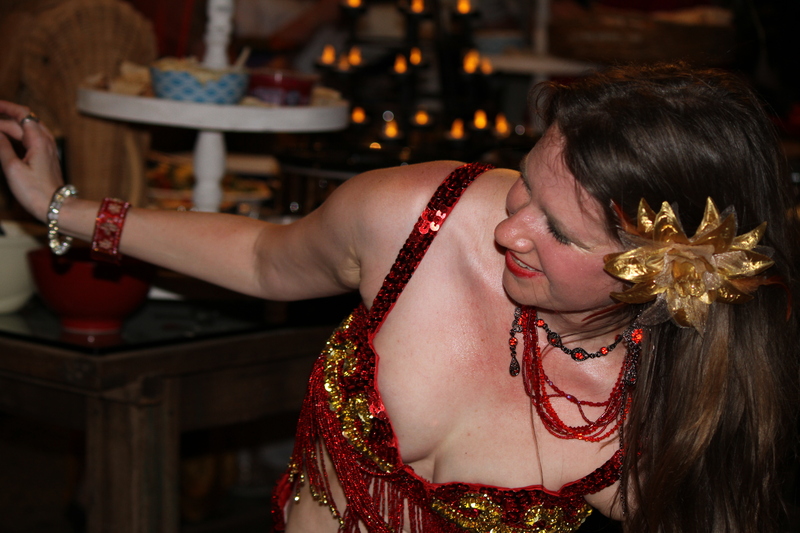 She is also available for party performances, private lessons, belly dance workshops, and teaching parties. Let her share her dance with you at your next special event. Contact her through Baba Ghanoush. Photo courtesy of Meghan L. Quinn.